The prospect of recording my own book in order to draw in people who may not want to sit and read a novel seemed like an easy enough task. At first, my intention was to hit the record button and give it a straight read through, stutters and hiccups intact. Ten hours of work, tops. Maybe ten more to go back through and edit out mistakes. I didn’t have the time or the funds to get the help of a voice actor, a studio technician, or distribution like a more professional audiobook. I figured I could offer a straightforward, unapologetic, clearly amateur recording as a giveaway for contests and promotions, which would also help boost the print and ebook sales. 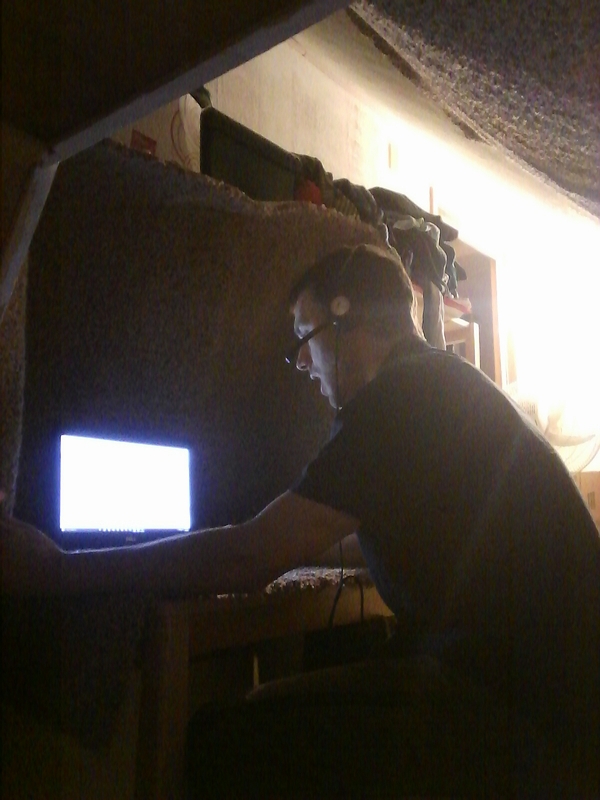 Without much of a plan, I constructed a makeshift studio in my attic at home, hanging carpet on the walls and ceiling. I purchased a Logitech H390 headset with a decent entry-level microphone. I downloaded Audacity, a free piece of software for recording and editing. I watched vocal lessons on YouTube. I watched online demos and listened to audiobook-related podcasts to learn a bit more. I grew pickier about my own rendering of certain key scenes and dialogue. I started hearing some of my own nasal ticks and uneven breathing. As I went on, I spent more and more time cleaning up the recordings and adding audio effects. On my lunch breaks at work, I locked myself in meeting rooms and piled soft chairs onto tables for a makeshift recording studio. The whole thing took me a lot more than ten hours. More like four months, and I’m still putting the finishing touches on the final chapters. One of the most rewarding aspects of the process was my rediscovery of At the Waterline ’s characters. While recording, I searched for consistent, recognizable speaking voices for each of them. I thought I’d found a solid, direct voice for Jack—the foul-mouthed old salt—but then it shifted a little, taking on a slightly fragile, wizened quality. Barry, the ex-priest living on his sailboat, began as a slow, hesitant voice that grew into something more assured and alert, as a way to match his growth as a character. Dory, the outspoken woman who runs the hot dog stand on the dock, was a lot of fun to explore. You can hear some natural laughter coming through in the audio footage as I tried to find ways to intone her boisterous, sometimes ill-considered exclamations. Other characters were not quite as colorful or distinct. Depending on who was present for a given scene, making characters discernable was sometimes very difficult. I can understand the decision to write a scripted version of an audiobook that is performed more like an old-fashioned radio play. I can also see why some audiobooks are produced as abridged versions. It’s not always about book length or funding or the audience’s perceived attention span. There are some scenes and passages that simply don’t work very well when read out loud. While recording At the Waterline , I was tempted to add or remove words here and there for clarity. I refrained, but if you listen along with a print copy nearby, you may hear a few “accidents” that I didn’t go back and correct. Recording an audiobook version of At the Waterline mirrored the writing process in so many ways with the initial drafts, developmental editing, and fine-tuning, as well as the surprises and discoveries—the story seemed to take on a life of its own all over again. For me, reading the novel aloud from start to finish has been a new window on the manuscript. As I’ve listened to each track over and over, listening for technical glitches, I’ve been surprised how many times I’ve gotten lost in the story and forgotten that I was supposed to be working on something. If you buy a print or ebook copy of At the Waterline in May 2017 and send proof of purchase to briankfriesen@gmail.com, you will receive access to the first three chapters of the audiobook.